Gulftainer, a privately owned United Arab Emirates port operator, registered a record gross crane productivity of 32.2 crane moves per hour in April 2018 at its flagship gateway terminal, Sharjah Container Terminal (SCT), in Port Khalid, informs Thomson Reuters Middle East edition Zawya. 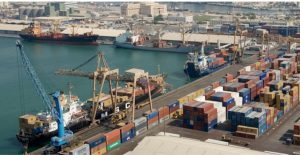 Compared to the industry average of 25 crane moves per hour, this significant milestone marks the highest productivity levels at SCT since its launch in 1976, when it became the first container terminal in the United Arab Emirates. Additionally, the port operator witnesses high customer demand to Shed 3, the new state-of-the-art warehouse facility for LCL shipments and loose-loaded cargo in Port Khalid. According to Gulftainer, the warehouse, which was inaugurated on 20 March 2018, has already filled up to over one-third of its total capacity, with local businesses choosing it as a cost-effective and efficient alternative to other storage facilities in the area. Shed 3 is to replace the existing Shed 2, which will be removed to facilitate the SCT capacity expansion through the extension of RTG stacks. Gulftainer highlights that the current achievements at SCT are the result of the appointment of Emerson Buarque as the new Terminal Manager. Having recently relocated to SCT from Gulftainer’s Brazil operations, Buarque has extensive experience in the international markets administration and has held various senior leadership positions in port operations in Brazil, Europe and Africa. Buarque graduated from the Brazilian Merchant Marine Academy in Rio de Janeiro, and completed his post-graduate studies in Business Administration, Port Management and General Management, in Brazil and Europe. He also highlighted the importance of employee wellness programmes such as Positive Pulse and continuous employee training for productivity records.